Leonbergers are far more than a dog created to look like a lion. Many were kept as farm dogs, drafters, and property/livestock guards. Historically they were owned by royalty and aristocrats throughout Europe. Today they are commonly kept as companions and many have found jobs in water rescue. The Leonberger was created in the town of Leonberg in southwestern Germany. In the 1830s and 1840s monks in the Swiss Alps were attempting to improve their St. Bernards and added Newfoundlands to their bloodline. Pups that did not have the appearance of St. Bernards were discarded and some were acquired by Heinrich Essig, the mayor of Leonberg. He used them as his foundation stock for his own dogs and later added Great Pyrenees and other unknown dogs before fixing the type. Legend states he wanted to create a dog that was reminiscent of the lion on the town’s crest. By the end of the 19th century he had completed his work and the Leonberger spread around Europe. Unfortunately, WWI left only five dogs in Germany and after rebuilding WWII decimated them back down to eight. Careful breeding saved the line and today it is firmly established worldwide. 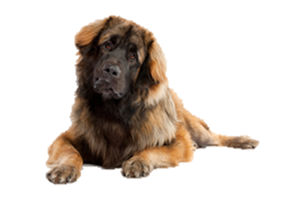 Is the Leonberger Right for You?